Western blot analysis of extracts from various cell lines using APOBEC3B (E9A2G) Rabbit mAb (upper) or β-Actin (D6A8) Rabbit mAb #8457 (lower). 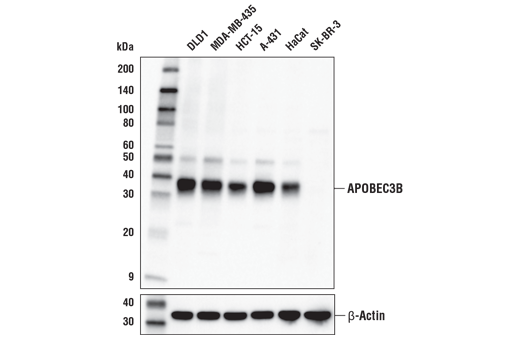 APOBEC3B (E9A2G) Rabbit mAb recognizes endogenous levels of total APOBEC3B protein. This antibody weakly recognizes a 50 kDa band on unknown origen in cell lysates. Based on the sequence of the peptide antigen, this antibody is not expected to cross-react with other APOBEC3 family members. Monoclonal antibody is produced by immunizing animals with a synthetic peptide corresponding to residues surrounding Pro206 of human APOBEC3B protein. Members of the APOBEC3 subfamily of cytosine deaminases (APOBEC3A, APOBEC3B, APOBEC3C, APOBEC3D, APOBEC3F, APOBEC3G, and APOBEC3H) function in innate immunity by preventing viral DNA replication, including that of HIV-1 (1-2). APOBEC3B mutation and aberrant expression in cancer is thought to result in mutation of genomic DNA, and to drive tumorigenesis. APOBEC3B is highly expressed in human breast cancer, glioma, and other human cancers (3-5). Olson, M.E. et al. (2018) Cell Chem Biol 25, 36-49. Siriwardena, S.U. et al. (2016) Chem Rev 116, 12688-710. Cescon, D.W. and Haibe-Kains, B. (2016) Genome Biol 17, 202. Zou, J. et al. (2017) Cell Biosci 7, 29. Schmitt, C. et al. (2018) Oncol Rep 40, 2742-49.